Get new tools to help you more easily tailor your layouts. Use new rulers, grids, and guides to get the design precision you need. Objects are easier to select and re-size and now display interactive states such as hover, pressed, or in focus. Plus, click "Undo" multiple times, so you can experiment with your layouts as much as you'd like. Converting your existing solutions is straightforward as well. Converted solutions maintain the original look and feel. Or you can apply a new theme if you choose. FileMaker Pro 12 comes with all-new Starter Solutions, re-built from the ground up to better showcase your data. You'll have the best working solutions possible for managing projects, scheduling resources, creating estimates, and much more. The Starter Solutions also include layouts customized for iPad and iPhone. Container fields in FileMaker Pro allow you to store any type of file in your database including photos, videos, music, documents, and more. In FileMaker Pro 12, container fields have been re-engineered to improve database performance and make your solutions even easier to use. Creating FileMaker Charts is a snap with new Quick Charts. Simply sort and group your data. Then click to bring up an integrated set-up window with an Inspector-like tool palette that allows you to preview and customize your chart. Easily create solutions customized for FileMaker Go for iPad and iPhone; free downloads from the iTunes App Store. FileMaker Pro 12 comes with a set of built-in iPad and iPhone themes that optimize fonts, colors, buttons, and other objects for your device. 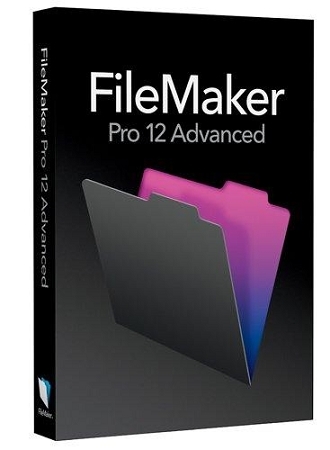 FileMaker Pro 12 is the fastest way to create stunning databases for you and your team. Now you can quickly build solutions that are crisp, clean, and make you more productive than ever. Instantly change the look of your layout by applying one of 40 stunning new themes specifically designed for your iPad, iPhone and desktop. Each theme comes with pre-defined fonts, colors, and object styling. In just a few clicks your layout has a professional, new look. Easily customize a layout to meet your needs by adding gradients, images, and more. Get new tools to help you more easily tailor your layouts. Use new rulers, grids, and guides to get the design precision you need. Objects are easier to select and re-size and now display interactive states such as hover, pressed, or in focus. Plus, click “Undo" multiple times, so you can experiment with your layouts as much as you'd like. What's new in FileMaker Pro 12? FileMaker Pro 12 comes with all-new Starter Solutions, re-built from the ground up to better showcase your data. You’ll have the best working solutions possible for managing projects, scheduling resources, creating estimates, and much more. The Starter Solutions also include layouts customized for iPad and iPhone. Drag and drop Microsoft Excel data into FileMaker Pro to get started. Or build a custom database for your unique needs. Add FileMaker Go to view, edit and search your FileMaker Pro database anywhere you go on the iPad and iPhone. Safely share with iPad, iPhone, Windows, and Mac users. Plus share your databases over a network with up to nine others. Get step-by-step reporting tools, including eye-catching charts, to help manage and automate tasks. Easily create and email reports in Excel or PDF.